I apologize - you are probably so tired of hearing about the Nordstrom Anniversary Sale by now - and there is still a week left. 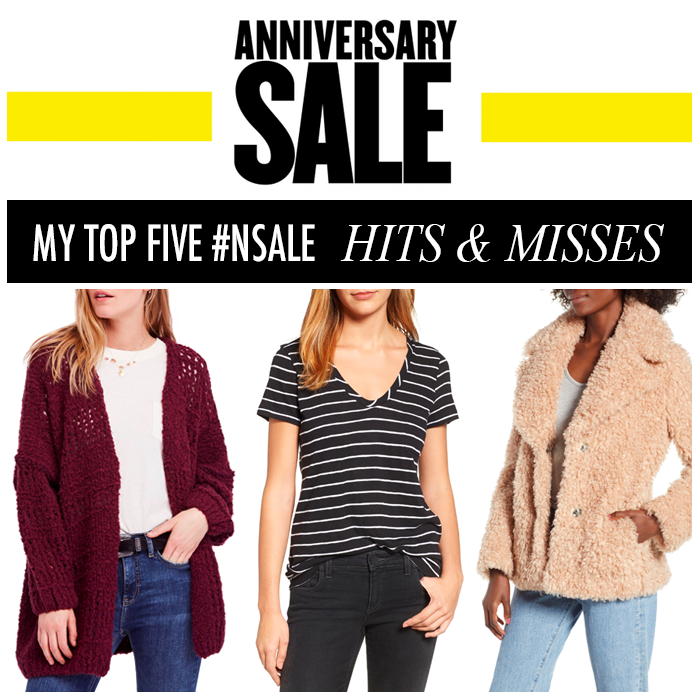 I just wanted to share my top 5 hits and misses from the sale, which I hope you find helpful. This is the softest tee. I bought it last year - and I got another one this year. It is a great layering piece - plus, it looks a little more dressy than just a plain tee. I have wanted a new pair of sunglasses - and I found these that are almost $100 off and so comfy and stylish! This cardigan is going to be a perfect fall sweater! I love the color - and it’s a great price. I spotted these boots in the preview catalog and I love them! One recommendation - they run a 1/2 size small. I have a feeling these might be my new favorite jeans this fall. They are under $50 - and I love the fit! I really wanted to love these boots. The fit was just not comfortable. I will agree with the other reviewers - the fit of this cardigan was big and just not what I was expecting. I saw this jacket in the preview catalog and I knew I wanted to get it. I was disappointed with the fit when I got it - not as cute as I thought it would be. I really wanted to love this sweater. It was so warm and cozy - but I just did not love it! This is one of my favorite (if not favorite) brand of jeans - but the fit of these jeans were off for me - and I did not like the distressing around the waist. This new arrival hooded poncho is 40% off. This new cardigan - in a staple pale grey heather and 40% off. This tweed pocket skirt is only $13. This red denim jacket is on sale - and a great statement piece. I love the color of this blazer. I cannot believe this wrap tank is on sale for $10 - and comes in different colors. This denim peplum jacket is on sale! This camo tee is on sale for only $10. This pink blazer is on sale for $30. I shared more fall trends + summer sales HERE. My Leith shawl cardigan arrived this week and I love it! Definitely a hit for me too! That soft tee sounds like something I should probably try -online it looks so snug so I've been dismissing it but I do love soft! I am loving the shawl Cardi too, got it in pink. Love the Marc Fisher boots you got. Have a great weekend! That tee looks so soft, wonder if it comes in a v-neck. Also the cardigan, glad to know it's a hit, was contemplating getting it...Happy weekend! Cute picks dear, especially the cardigan. Definitely a must have!